A goalkeeper’s position is a demanding one. 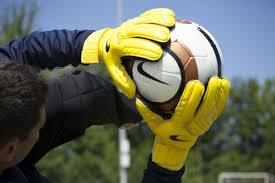 Goalkeeper gloves are necessary to prevent injury, therefore buying the right gloves for your hands are important. Here are some tips to consider when buying gloves. Grip – You should look at how well the gloves grip (stick) to the ball. A smoother foam grip, would stick to the ball more than dimpled foam. It is best to stay away from rubberized grids as they tend to not grip the ball enough. Look at gloves that are designed where the entire palm surface is foam. Durability – If you usually have good grip, you may have to forfeit durability. But some gloves will come with a durability and grip ratings. Cushioning – Cushioning helps to reduce the impact of the ball. Your cushioning should be sufficient to reduce the sting of the impact, but still maintain good grip. Wrist support – You should look for a wide wrist strap, that can be tightened to suit your wrist. Good wrist support will reduce injury. Comfort – Look for gloves made with breathable fabrics and vents to prevent your hands from sweating. Fit – The fit of a pair of gloves will differ from goalkeeper to goalkeeper. If you prefer close fitting gloves, look for one with negative-cuts, these are gloves with the finger seams sewn inside. Additional features – New brands come with many features, which may include finger protection, special foam, differently sewn seams and breathable fabrics. Goalkeeper gear can be quite expensive, therefore ensure that you do your research before you visit a store to purchase.